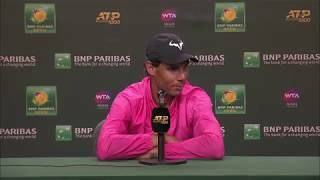 Roger Federer Post-Quarterfinal Match Press Conference at the BNP Paribas Open after his victory over Hubert Hurkacz. 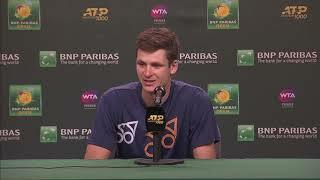 Hubert Hurkacz post-match interview after his loss in the quarterfinals against Roger Federer in the BNP Paribas Open. Roger Federer catches up with press after his victory over Stan Wawrinka. 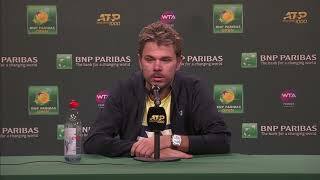 Dominic Theim talks about his victory at the BNP Paribas Open. 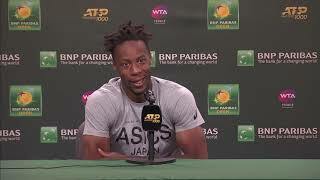 Gael Monfils talks to the press following his withdrawal from the 2019 BNP Paribas Open. 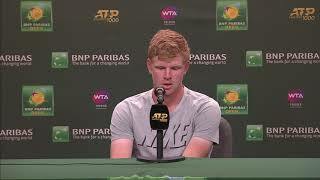 Kyle Edmunds talks to press about his loss to Roger Federer at the BNP Paribas Open. Roger Federer speaks with the media following his 7-5, 6-1 victory over Kevin Anderson in the quarterfinal round of the BNP Paribas Open in Indian Wells. 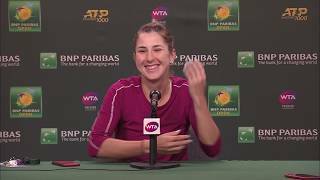 Sabalenka / Mertens press conference after their first doubles win as a team at the BNP Paribas Open. 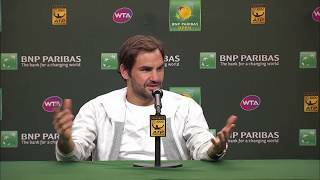 Roger Federer speaks to the press following his quarterfinal round match at the 2018 BNP Paribas Open in Indian Wells. 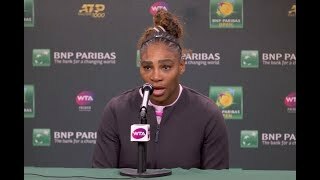 Roger Federer speaks to the press following the championship match at the 2018 BNP Paribas Open in Indian Wells. 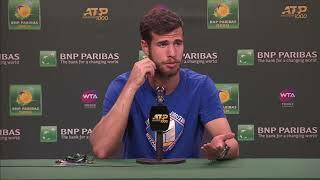 Karen Khachanov's talks to press after his loss in the quarterfinals to Rafael Nadal. 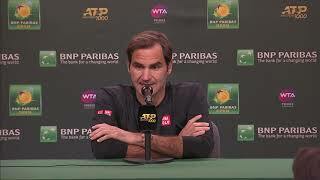 Roger Federer speaks to the press following his semifinal round match at the 2018 BNP Paribas Open in Indian Wells. 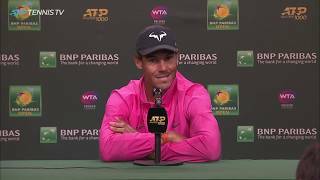 Rafael Nadal's talks with the press after his quarterfinal win over Karen Khachanov at the BNP Paribas Open. 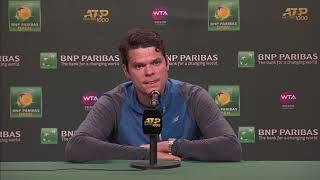 Milos Raonic talks about his loss to Dominic Thiem in the semifinals of the 2019 BNP Paribas Open. Roger Federer speaks with the media following his 6-4, 6-4 win over Tommy Haas in the fourth round of the 2014 BNP Paribas Open in Indian Wells. 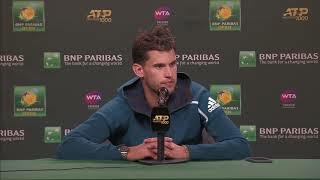 Dominic Thiem talks to press after his semifinal win at the 2019 BNP Paribas Open. Roger Federer speaks to the media after his 6-3, 6-1 win over Alexandr Dolgopolov in the semifinal round of the 2014 BNP Paribas Open in Indian Wells. 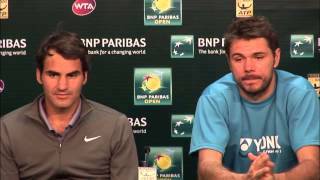 Roger Federer speaks to the press following his 6-3, 3-6, 7-6(3) loss to Novak Djokovic in the 2014 BNP Paribas Open final. 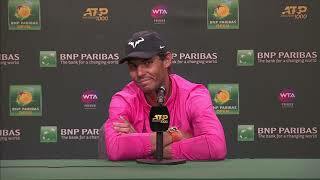 Roger Federer speaks to the media after his quarterfinal match at the 2015 BNP Paribas Open. Novak Djokovic talks to press after losing in an upset against Phillip Kohlschreiber. 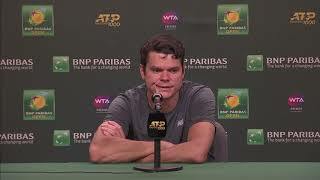 Milos Raonic talks to press about his victory and advancement into the 2019 BNP Paribas Open semifinals. Novak catches up with the press after his win over F. Fognini. Roger Federer speaks to the media after his semifinal match at the 2015 BNP Paribas Open. 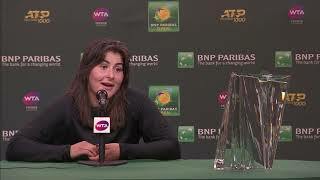 Bianca Andreescu talks to the press about her finals win at the 2019 BNP Paribas Open. 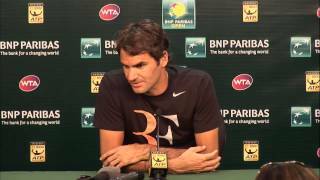 Roger Federer speaks to the media after his fourth round match at the 2015 BNP Paribas Open. ©2018 by metta world peace panda shoes. All Right Reserved.